Have you ever got into a hobble that your new iPad Air cannot play MP4 file? Do you want to import MP4 video to iPad Air for playing on its 2048*1536 retina display? To fix this issue, you can follow the guide below. This 9.7-inch iPad boasts a superb retina display with a 2048*1536 resolution, delivers up to 2x faster than the iPad 4 in both CPU and graphics performance with its A7 chip and promises us 10 hours of surfing the web on Wi-Fi, watching video, etc. Now that the fifth-generation iPad offers us such an amazing visual feast, to have all your MP4 files played on iPad Air becomes necessary. However, you may fail to import MP4 to iPad Air sometimes. This is because all Apple's iPads are only compatible with MP4 videos when encoded in a proper way. So you have to convert MP4 to iPad Air readable format with the right video coder or video parameter beforehand. To get the job done, MacX Video Converter Pro is the ideal solution that provides an extremely easy but efficient MP4 to iPad Air conversion on Mac with super fast speed and zero quality loss. With the optimized preset for any generation of iPad, you can easily transcode MP4 to iPad Air, as well as other generations of iPad, be it iPad Pro, iPad mini 4, iPad Mini 2, iPad Mini, iPad 3 or iPad 2, in a fraction of seconds. Best MP4 video processing program to import and convert MP4 to iPad Air/Air 2 (iPad Pro/mini 4 etc) with 5X faster speed (Intel/Nvidia/AMD HW acceleration) and no quality loss. Step 1: Add MP4 Video File. 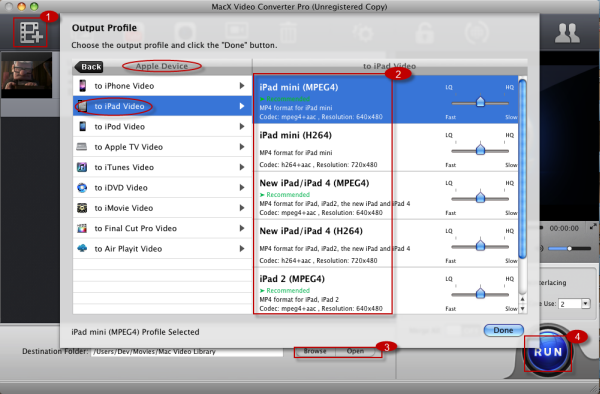 Free download this MP4 video converter for iPad Air on Mac computer, install and run it. Click "Add File" button to import the MP4 file you want to add. Or drag and drop the MP4 file. This utility is preset with optimized profiles for your iPad Air/Air 2 or iPad Pro/mini 4 etc. To do it, just go and hit "Apple Device" -> "to iPad Video" and choose the specific generation of iPad at your fingertips. Then click "Done" button to finish the output format selection. Tips: Built-in 320+ video and 50+ audio codecs, this MP4 converter allows you to convert among a divere array of video formats, like MKV to MP4, WMV to MOV, FLV to AVI, MTS to MOV, etc. Click "RUN" button to start MP4 to iPad Air conversion on Mac OS. After a short period of transition, you can add MP4 file to your iPad Air via iTunes sync and play MP4 video on iPad 5 without limitation. 1. Click "Edit" button on the main interface to trim the video segment, crop the MP4 video size to better suit your iPad Air, merge several MP4 videos into a new one, add watermark and external subtitle at your disposal. 2. Select "High Quality Engine" to improve the output MP4 video quality while playing on iPad Air. 3. Set the CPU core use to enhance the MP4 to iPad Air conversion speed. 4. 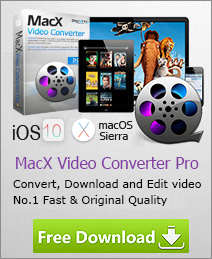 For PC users, please visit its windows version of iPad video converter.